Come and join fellow Yalies and alumni from Princeton, Harvard, Yale, Columbia, Dartmouth, Brown, UPenn, Stanford and Cornell, for a festive holiday gathering at the picturesque Somerset House, Portico Rooms. Click here to book and reserve your tickets now! There are no ID requirements, however if one or more attendees is under the legal drinking age, then IDs may be required. To be safe, please bring ID with proof of age. No children under the age of 12 please. 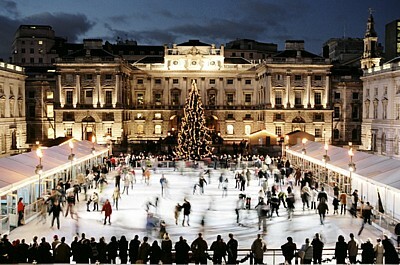 Somerset House is easily accessible via tube, bus, overground or taxi. The closest tube stops are Waterloo, Temple, Covent Garden, and Charing Cross. Many buses stop at Aldwych, which is located directly next to Somerset House. If you are taking the overground, it is best to arrive at Waterloo and walk or bus over the Thames. Refunds will only be given in the event of event cancellation. Please do not bring any beverages or food into the event. If you have any food intolerances please contact us to alert us to them. Please note that we will be trying our best to not include any peanut foods. No. We will have a list of attendees at checkin. If in doubt, you can have your confirmation email on your phone.